Tabs Studio v2.3.7 released: added the Animate tab movement option for the Stable tabs layout, enabled the AvalonStyleEditor, Marker, NewGroup, Saver, Sync and XMenu add-ins by default, improved tab measurement and arrangement correctness in the Shaper add-in. Download link: Tabs Studio v2.3.7. See Tabs animation demo how it looks like. 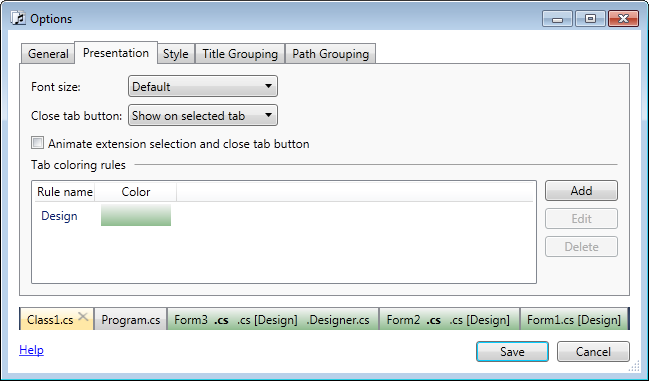 Tabs Studio v2.3.6 released: added the Stable tabs layout, updated the SingleRow add-in to support the Stable layout, updated the Marker add-in to not create a settings file for a solution when no tabs are highlighted, fixed an occasional 1 pixel wide gap between tabs in Visual Studio 2010. Download link: Tabs Studio v2.3.6. The first actual stability feature is RowBuffer. RowBuffer is space reserved on each tab row that keeps tabs on their positions when some of them slightly increase width. For example, default 30 pixels of RowBuffer can absorb additional width of a close tab button when you switch to this row and 3 document modification asterisks. Another stability feature keeps tabs on their positions when some of them become shorter. When it is possible to reduce number of rows due to shorter tabs, a new arrangement is delayed until the next major relocation. Events that trigger major relocation are tab creation, tab removal, window size change. Events that don’t lead to tab rearrangement (within limits of RowBuffer) are tab selection, document modification, tab extension creation or removal. 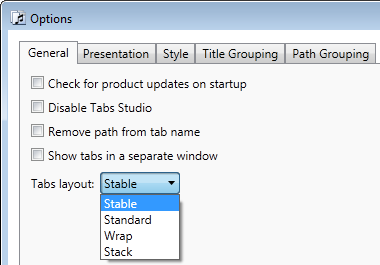 For a new Tabs Studio installation Stable is the default layout now. I’m thinking about removing Standard and Wrap layouts in the future. Tabs Studio v2.3.5 released: added the Tab extensions regex rule to the Tab Coloring Rule dialog and added the TabExtensions property to the Tab control, updated the Marker add-in to save the highlighted tabs list when you close Visual Studio and restore highlighting when the solution is opened the next time, fixed several bugs in the Saver add-in preventing it to correctly restore tabs order. Download link: Tabs Studio v2.3.5. 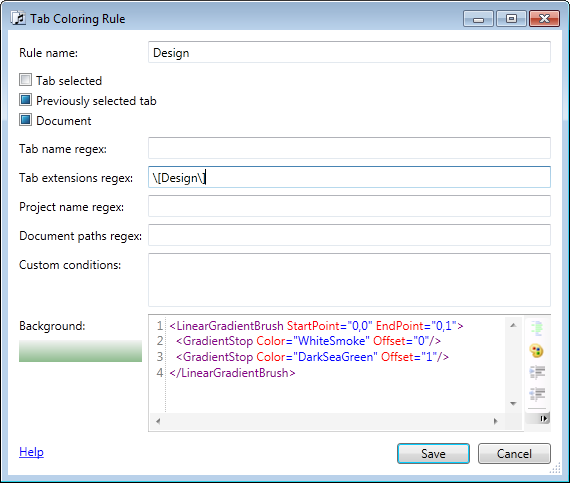 Usually you set color for tabs using the tab name and project name regular expressions in the Tab Coloring Rule dialog. If you want to color tabs by type (for example .cs or .xaml) you can use the document paths regex. But then there are form designer [Design] tabs that can’t be matched using the existing rules. I’ve added the TabExtensions property to the Tab control that consists of the extensions list separated by ‘$’. For example, “Form2 .cs .cs [Design]” tab has “TabName=Form2” and “TabExtensions=.cs$.cs [Design]$”. Note, that a single tab like “Class1.cs” still has the name “Class1” and the extensions “.cs$”.